This week, March 2-6 is National School Breakfast Week. 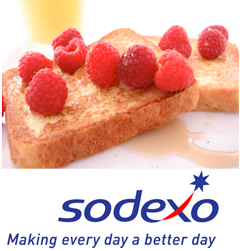 To help raise awareness for the importance of breakfast for students, Sodexo, a leading provider of food and nutrition services has created a list of the Top Ways Breakfast Helps Students. I like this list because it not only notes that nutrition is key, it notes other beneficial factors of at-school breakfast like the fostering of friendships and promoting healthy social interaction among students. And in a day of Internet-twittering, cellphone technology everything, tending to social skills is a great thing. “Studies repeatedly show that a healthy and nutritious breakfast is a key driving force for improved scholastic achievement from students in grades K-12,” said Roxanne Moore, registered dietitian and national director of wellness brand for Sodexo. Moore said a Harvard University and Massachusetts General Hospital study discovered that students who usually ate school breakfast had improved math grades, reduced hyperactivity, decreased absence and tardy rates, and improved psycho-social behaviors compared with children who rarely ate school breakfast. Research shows that eating breakfast every day is an effective means for controlling weight. By encouraging kids to make breakfast a habit now can help them lead healthier lives as adults. Breakfast presents an ideal opportunity for a child to consume essential nutrients for health, one of which is iron. Iron is an essential component of proteins involved in transporting oxygen throughout the body, thus helping students concentrate in the classroom. Without a doubt, a student’s ability to socialize with peers in a school setting plays a significant role in scholastic achievement. Kids who are well-fueled in the morning have more energy to socialize and engage in morning activities. When kids get an opportunity to assemble and prepare their own breakfast, they are learning critical life skills. By teaching kids things like the proper technique for cracking eggs, the importance of properly washing their hands before preparing or eating meals and how to measure ingredients to make dishes, kids are also learning about a broad range of subjects including nutrition, math and science. I am a big fan of breakfast-especially for kids. I loved researching my post about the different typical breakfasts around the world. 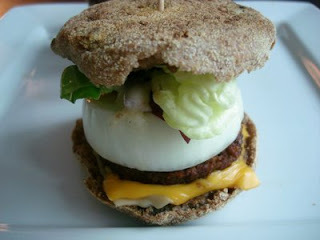 Get the recipe for my Giggling Morning Vegan Muffin sandwich here.